The out basket: Kitsap County Traffic Engineer Jeff Shea says there is no apparent need for such a change. “The speed limit on Seabeck Highway was set in 1976,” he said. “.Speed limits are normally reviewed when conditions along the road change significantly. “Changes could include significant land development, roadway geometric changes, and high collision occurrence among other considerations. “Very little has changed along Seabeck Highway in this area,” Jeff said. “Along with little changes along the road, the collision history is minimal with about 3.5 collisions per year on Seabeck Highway between Newberry Hill and Holly. The in basket: It was almost a year ago that Michael Johnson asked the Road Warrior the reasoning behind the 55 mph speed limit on Highway 16 for miles on either end of the Tacoma Narrows Bridge. There didn’t seem to be any need for the lower limit with the new bridge keeping traffic flowing freely. State highway officials said at the time they were in favor of making the limit near the bridge the same 60 mph as most other places on the highway, but had run afoul of an environmental snag. Raising a speed limit where some pollution levels were higher than allowed needed some approvals the highway builders didn’t have. And getting that OK looked like it could take a while. I asked this month how it was going. The out basket: It’s likely to happen eventually, state highway officials say, but now it’s waiting for something else. The State Patrol asked that the limit be left at 55 mph until the huge construction project at Nalley Valley where Highway 16 and Interstate 5 intersect in Tacoma is completed. “I believe the increase will occur once the work is done,” says Traffic Operations Engineer Steve Bennett of the state. What can you get away with beyond a ‘Road Closed’ sign? The in basket: Gary Felt, who lives just outside the city of Port Orchard on Highway 166, and says it “is often closed due to mud slides, or sometimes just the fear of a slide,” wants to know what he is allowed to do when that happens. Gary described a situation in which an officer followed him past the barricades during a “Local Traffic Only” period, nearly to the other end of the closure, where his driveway was. Just as he reached the driveway and signaled a turn, the officer turned on his emergency light bar, then turned it off immediately and went back to town. The out basket: I posed the questions to Chief Al Townsend of Port Orchard police, whose officers have jurisdiction over most of Highway 166, though not right at Gary’s’s driveway. He said a lot is left to the discretion of the officer. “Local Traffic Only” offers more latitude than “Road Closed,” since the latter may anticipate a problem, like a gas leak exploding or an unstable hillside giving way, rather than sealing off one that already has occurred. And it depends whether the person is caught inside the outer barriers, designed to detour traffic from going where it would just have to turn around and come back, and the inner barriers designed to keep drivers from actually running into the reason for the closure. You’d be more likely to get a ticket if you are inside the inner barriers. But even then, the owner of a home or business in the closed area normally can arrange to get there by calling the road department or police department to get permission in advance, Al said. At worst, the caller would learn that the emergency is dire enough that he really shouldn’t be near it. The city of Port Orchard has an ordinance making it illegal to violate an emergency road closure, which is a misdemeanor that requires an appearance in court. The officer might choose between it and citing for failure to comply with a regulatory sign, a traffic infraction. Al said if stopped, a person who can show that he was trying to reach a particular home or business within the closure normally would be allowed to proceed. If nothing else, it would be a “clear mitigating factor” to use in challenging the citation in court, he said. An officer is free to follow a car outside the city limits and cite the driver if he passed through the closure and wasn’t “local traffic” going to somewhere within it, he said. “A lot of times, when we have had slides,” he said, “people think they can go down there and meander through the mess and get by, or there may be DOT workers in the midst and now they are dodging workers and equipment to try to get through. Bicycles must comply the same as the driver of a car. Pedestrians can continue if there is a sidewalk and it isn’t closed, Al said. If there is no sidewalk, such as along most of Highway 166 west of Port Orchard, the closer one got to being in the way of road crews or getting hurt, the more likely that he could be cited, Al said. Finally, he said, a driver who chances going into the closed stretch and his car is damaged might find his insurance company reluctant to cover what it would have on a road that isn’t closed. The in basket: Robin Henderson e-mailed to ask if I’d seen the video produced by Washington State Patrol on YouTube, informing its viewers of this state’s legal requirement to stay out of the left lane of multi-lane highways if you aren’t passing a slower-moving vehicle. You can be ticketed for “camping out in the left lane,” as that’s often called. The image atop this column, from an e-mail my cousin sent me, expresses the same sentiment. The in basket: I had seen the video, just the day before, when I got a WSP news release about it. You can see it at www.youtube.com/watch?feature=player_embedded&v=tIA2pueFMh4. I don’t get too exercised about left lane campers, many of whom I think aren’t so much inconsiderate as genuinely afraid to confront the blind spot challenge that moving right presents. 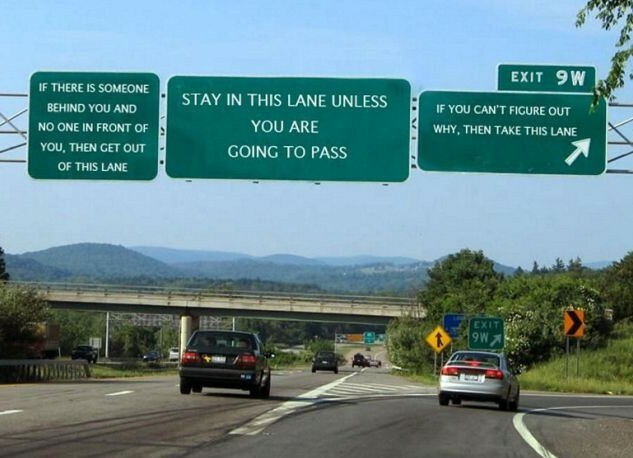 I usually can use the right lane to get around them quickly enough. Even I find changing lanes to the right frightening on a crowded three- or four-lane urban freeway at night, more so since 2000 when I had neck surgery. But I make it a point to move right if the driver behind me makes it clear he wants past by moving up on me, even if I’m going over the speed limit. My wife, The Judybaker, is one who won’t move right for a car coming up on her from behind if she is doing the speed limit in the left lane and the traffic to her right is traveling slower than the limit. Of course, by definition, she then would be passing slower moving traffic and would be legal. But it still might irritate drivers behind her who want to exceed the speed limit, and probably would consider her a left-lane camper. If the right lane traffic also is doing the speed limit, so she’s just pacing them, she could be risking a ticket. Or risk being stopped and warned, which the video says is a frequent result. The video says there are exceptions to the rule, but doesn’t list them. They are when preparing to exit the highway to the left or to allow the merging of another vehicle, such as at a freeway on-ramp. I urge those who get angry at left-lane campers ahead of them to make the following mental calculation. If you’re stuck behind such a driver for two minutes, you haven’t been delayed two minutes. You’ve been delayed only as long as it takes you to make up the distance you would have traveled at your preferred speed compared to the speed you were forced to travel. It’s usually a few seconds. If you won’t miss a ferry, you can live with it. The in basket: Mary-Jo Cantwell writes, “When on earth is someone going to fix the gigantic pothole at the Silverdale Post Office? This gaping hole, right at the entrance to the drive-up mailboxes, is almost impossible to avoid and is getting worse everyday. The out basket: Pot holes in shopping areas are fairly commonplace and can go unrepaired for quite a while. Note the one that just got filled in the access road that runs past Eddie Bauer into the Costco parking lot in Silverdale, and those that appear from time to time in the winter at one of the front accesses and the back road into South Park Village Shopping Center in South Kitsap. It can be a little hard to pin down who to complain to and the absentee property managers can remain unaware of them for quite a while. Silverdale Postmaster Harry Kleinfelder, for whom I left a message about the pot hole last Friday, called me back Monday to say he was very much away of the one Mary-Jo mentions, but said the postal service doesn’t own the building and wasn’t the responsible party. Happily, though, Harry said that when he came to work that morning, he found that whoever IS responsible had filled the pot hole over the weekend. It wasn’t the county, says spokesman Doug Bear, which doesn’t maintain private streets. “It’s not perfect, but it’s patched,” Harry told me. Presumably someone got to the correct property management firm about the same time as Mary-Jo complained to me.